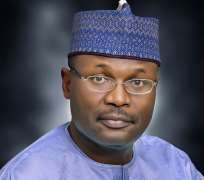 The Independent National Electoral Commission (INEC) on Monday said it has removed over 300,000 names from its voter register ahead of the 2019 general elections. INEC Chairman, Professor Mahmood Yakubu, disclosed this when he received a delegation of ECOWAS Pre-Election Fact-Finding Mission, led by the Chairman of Sierra Leone’s National Electoral Commission, Mohammed Conteh, in Abuja. Yakubu said the names were removed from the register after the Automated Fingerprint Identification System was carried out on the biometric data of registered voters. The INEC boss urged Nigerians to make use of the opportunity to assist the commission in identifying names of ineligible voters for further clean-up. “For the registered voters, we have been cleaning up on our own, using the AFIS. As at last week, before I travelled, I was told that over 300,000 names were dropped after the application automatic finger prints identification system . “But the cleaning of the voter register is not the sole responsibility of the commission; it is also the responsibility of every Nigerian. That is why the law says that we should display the register for a period of six days between Nov. 6 and Nov. 12. We will display the voter register in 120, 000 polling units nationwide. Yakubu told the mission that INEC was well prepared for the 2019 general elections. “In fact, we can say that the 2019 general election is perhaps the most deliberately well-planned election in our history. “We have finished the strategic planning; we have finished our strategic programme of action, and we have completed the election project plan. We have issued the timetable and schedule of activities for the 2019 general elections,” Yakubu said. Yakubu also disclosed that the commission would by November 9 or 10,release statistics of political parties that nominated candidates for governorship elections to be conducted in 29 states and the State Houses of Assembly in all states. Speaking earlier, leader of the mission, Mr. Conteh, said they were in Nigeria to gather relevant information and see how prepared INEC was for the general elections. “This is a fact-finding mission to the Federal Republic of Nigeria ahead of the elections. As you are aware that it is common before we start any election, organisations such as ECOWAs come and see under which election is conducted and gather information in respect of the elections. “More importantly, meet with you as a major stakeholder, as election management body that is responsible for the conduct of election to discuss with you and see how prepared you are for the election,” Yakubu said. Another member of the delegation and former Chairperson of Ghana’s Electoral Commission, Mrs. Remi Ajibewa, said the mission would use the visit to meet with other ‘electoral stakeholders’ in the country.